The town of Pahrump tourism department delivered its fiscal year 2016 findings to the board of commissioners Tuesday. In a destination analytics presentation led by tourism director Arlette Ledbetter, the numbers showed that Pahrump had a 72 percent hotel occupancy rate during the fiscal year. The hotel occupancy in town is above that of the national average of 66 percent, according to Ledbetter. The fiscal year 2016, which ran from July 1, 2015 to June 30, 2016 showed that 425,600 people visited the town during the fiscal year, generating $75.7 million in economic impact for Pahrump. 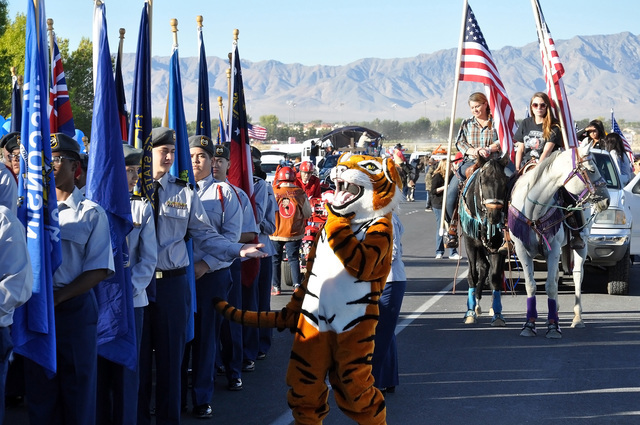 Of those visitors, the town of Pahrump said that 207,556 were the result of town attraction visitation. Those attractions include the Fall Festival, the Balloon Fest and the Grape Stomp, in addition to others. “What we have here is the data to what drives our economic analysis,” Ledbetter said. There was a total room night count of 296,070 from those visitors, that saw an average daily rate of $72. RV occupancy rate in town was much lower in comparison, as the recreational vehicle saw a rate of 46 percent. The average daily rate for an RV site was around $32. To better understand where Pahrump sits regionally, Ledbetter broke down hotel occupancy rates of nearby cities. She said Las Vegas is at 88 percent, Laughlin had a 61 percent occupancy rate and Mesquite saw a 74 percent rate. Ledbetter broke it down further and compared their percentages with the number of rooms that were in each city. Ledbetter said that the inventory in Pahrump includes 418 hotel rooms, 56 cabins and 1,100 RV sites. She did state the majority of hotels are reporting, not the entire sum. Compared to the percentage rates and the amount of available rooms of surrounding areas, Ledbetter explained that the valley is doing well. With the much lower RV occupancy rate and the far larger amount of available spaces, Ledbetter said the town must focus on the recreational vehicles. “We have identified through this that we need to focus additionally on our RV occupancy,” she said. As a reference point, Ledbetter said that when someone is looking to purchase an RV park, they look for an occupancy rate of at least 50 percent, which Pahrump is currently just below. With the data they have, Ledbetter is looking forward to figuring out weak spots in the tourism plan in town and building off the current tabulations. “I think tourism is on track to deliver a robust campaign for the year,” she said. “I’m excited to see what we are doing in the future in a comparison with these numbers,” she said.